The Shipping Method Populator feature will automatically show all applicable shipping rates and methods to your customers in the shopping cart and checkout pages. With E-Commerce systems, your customers have to choose a shipping method, then click apply, and they are shown the rate for the method selected. With the Shipping Method Populator, they are shown all methods at once. To learn more about how adding a Shipping Method Populator can change the way customers choose shipping methods, click here. If you would like your customers to see applicable shipping methods and rates on the product page, you may be interested in the Shipping Calculator. 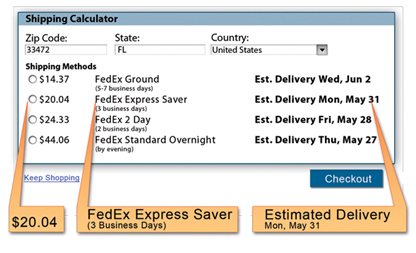 To also show the estimated delivery dates, check out the Delivery Date Estimator.